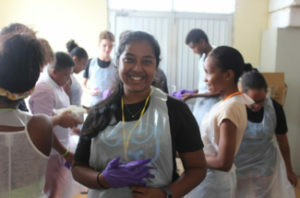 Saratha Naiken is a participant on our Blue Economy Youth Programme – a one-week practical programme for school children from Seychelles, run by Ben Taylor, Education & Outreach Manager for WiseOceans Seychelles. Within just a few days of the programme, I have already learned many interesting facts and figures on the importance of our Blue Economy. Being able to participate in the programme has given me the chance to understand the detailed concept behind the key sectors of the Blue Economy. I have learned that the Blue Economy does not only involve marine biology and marine conservation but also plays a major role towards the economic, industrial and tourism sectors in Seychelles. The Blue Economy takes into account the positive and negative impacts of all these key players. Presentations: The Blue Economy, marine biology, oceanography, ecosystem services, Marine Protected Areas and the law of the sea. Beach Profiling: We learnt how to conduct beach profiling, its importance and the process of cross-shore sediment transportation. Educational games: Through educational beach games, we have learnt about the process of long-shore drift and the importance of mangroves, reefs and seagrass against wave action. 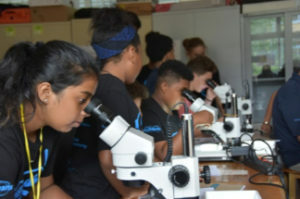 Lab Research (UniSey): We learnt how to collect plankton samples and use microscopes to study these organisms. 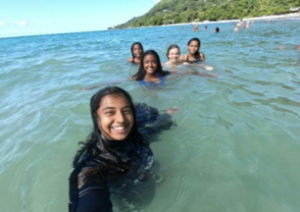 Snorkelling: Due to weather conditions, we were unable to do snorkelling where we were supposed to identify different corals, invertebrates and fish. Seychelles Fishing Authority (SFA): Learnt about different projects taking place, microscopy work and fish dissections, learning about the anatomy of fishes. I am keenly looking forward to another fantastic week of education and enjoyment!